Photo taken by Alan Neame. 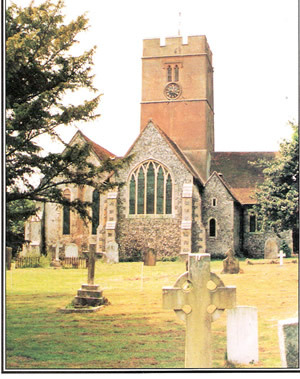 The parish of Selling lies four miles south of the town and port of Faversham (the royal town) and is the pre-Christian burial ground of the Jutish Kings of Kent. The name ‘Selling’, in old Kentish or ‘Jutish’ language as it was known, means a settlement in the woods. The old Jutish dancing ground lies somewhere beneath the chancel floor of the church. Before the introduction of Christianity, the people of the county of Kent, as with the rest of England, were invaded by several northern foreigners, and Kent itself was divided into four regions. It was also part of the seven kingdoms of the Anglo Saxon period. The Jutes were a Germanic people who are believed to have originated from Jutland in modern Denmark. The Jutes, along with the Angles, Saxons and Frisians, were amongst the Germanic tribes who sailed across the North Sea to raid and eventually invade Great Britain from the late fourth century C.E. onwards, either displacing, absorbing or destroying the native Celtic peoples there. They ended up settling in Kent, Hampshire and the Isle of Wight. 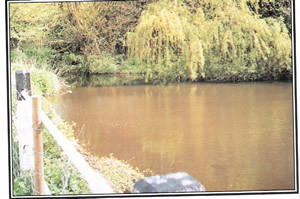 A surviving relic of this pagan era is The Ghost Hole Pond (meaning the Hollow of the Spirits) which lies very close by to the east. It is in this pond that, during the reign of the Jutish Kings, maidens, grown men, horses and carts were sacrificed to ensure a good harvest. The human sacrifice was undertaken by ritual drowning followed by much feasting and dancing in the victim’s honour. Our present church of St. Mary The Virgin was a replacement building of the original church, built around 1190. The West Wall, the tower and the Chancel are still standing today. During the time of Edward I the Nave was rebuilt to the present design, while the fenestrations and decorative battlements date from c.1450. However, the earliest mention of a church on this site is in a grant of 1045 during the time of Edward the Confessor when Selling Church and other property was awarded to the monks of The Benedictine Abbey of St. Peter and St. Paul, which was more commonly known as St. Augustine’s Canterbury, and is mentioned in the Domesday Book of 1086. The church continued on as the property of St. Augustine’s until the dissolution of the Abbey in 1538. In 1545 King Henry III granted Selling Church to Sir Anthony St. Leger of Ulcombe, Kent, whose son sold it to Sir Michel Sondes of Throwley (he died in 1616). Patronage of the church then passed down through to his heirs to the Earls of Rockingham (Watson), to Monson, Milles, Milles-Lade (Earls Sondes) and then on into the hands of the Archbishop of Canterbury. The Church remained in the hands of the monks of St. Augustine’s for a period of 493 years and they were responsible for almost every architectural feature seen today. At the West end of the church, there is a large pedestal monument to Thomas Neame (died 1817) and his children. He was the first Neame to live in Selling. South of the monument there is a headstone commemorating Elizabeth (died 1834), eldest daughter of John Hogben of Harefield Farm who married Thomas Neame’s first cousin John at Selling in 1798. The oldest legible tombstone belongs to Lewes and Catherine Lees (she died 1681) who gave their name to Lees Court in the neighbouring town of Sheldwich. At a conservative estimate there must have been at least four thousand people buried in the churchyard during the four hundred years of record keeping of the Burial register, to say nothing of those who died between 1046 and 1558 and even earlier. Their graves being mostly unmarked mounds until the introduction in 1920 of a lead marker numbering system for new graves which are entered in the Sexton’s Book and in the margin of the Burial register. We are very grateful to Alan Neame (family historian and founding member of the Kent Genealogical Society) who for thirty years researched into our family history. He was ably assisted by the significant collaboration of Joyce Gibson nee Neame. It is really thanks to Alan that any of us are aware of the others' existence. Alan travelled the world meeting people and recording their data for the benefit of all of us.